I typically like to keep this blog food-focused. However, after experiencing the Aeolian Islands, located off the north coast of Sicily, I HAD to dedicate a post to this beautiful paradise. 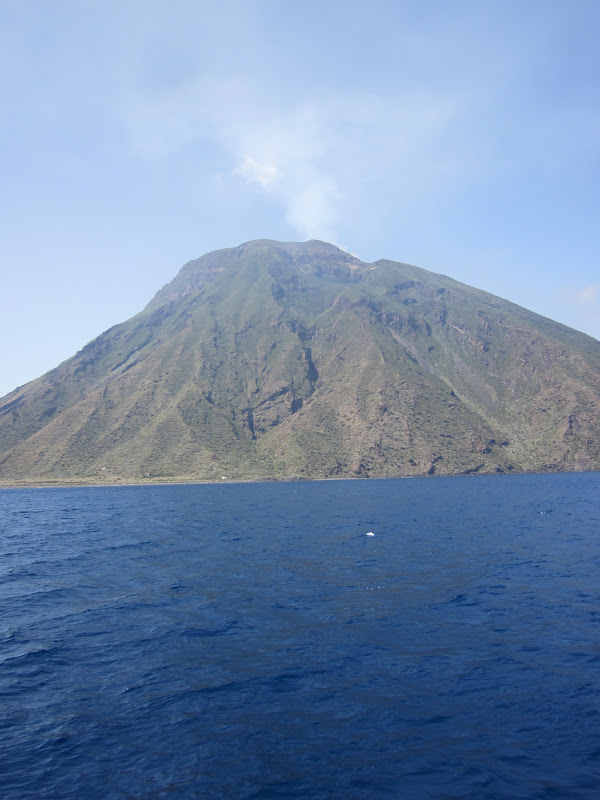 The island of Stromboli, a "perfect" triangle with a single volcano in the center. With a group and a guide, we hiked to the top of the volcano (at 920 meters in elevation ) and watched it erupt just after sunset. It was challenging, but also one of the most amazing experiences I have had in Italy. Nearing the top, we were above the clouds. 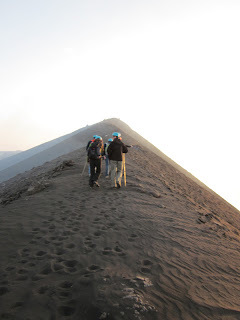 We hiked the narrow ridge to the top and watched the eruptions from above the crater. It was very cold and windy on the top, with ash particles flying around. These are the "islands of wind". Beautiful Salina island with Filicudi in the distance. Wild purple poppy with Panarea and Stomboli in the distance. The color of the water is intensely blue! There are 7 islands in total. 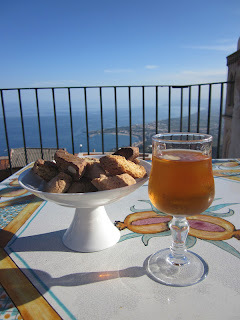 This is the view from Lipari to Vulcano. Vulcano is known for it's stinky sulfur mud baths. Vulcano island also has an inactive volcano. 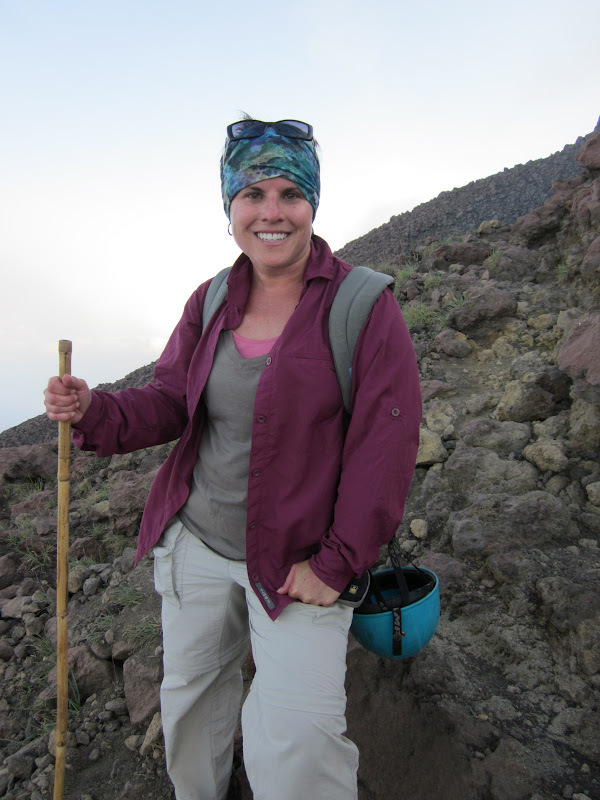 This hike is much easier and faster than stromboli, but also rewarding! For those of you who know me well, you know I will order cheese over dessert any day of the week. In Sicily, I might have to order both! Sicilians do not take their pastries lightly. I mean this literally and figuratively. It's a good thing I do not have a serious sweet tooth or I might be leaving this island with a few more kilos than I came here with! A fried pastry dough, filled with fresh sheep's milk ricotta cheese and speckled with chocolate chips, dusted with powdered sugar. 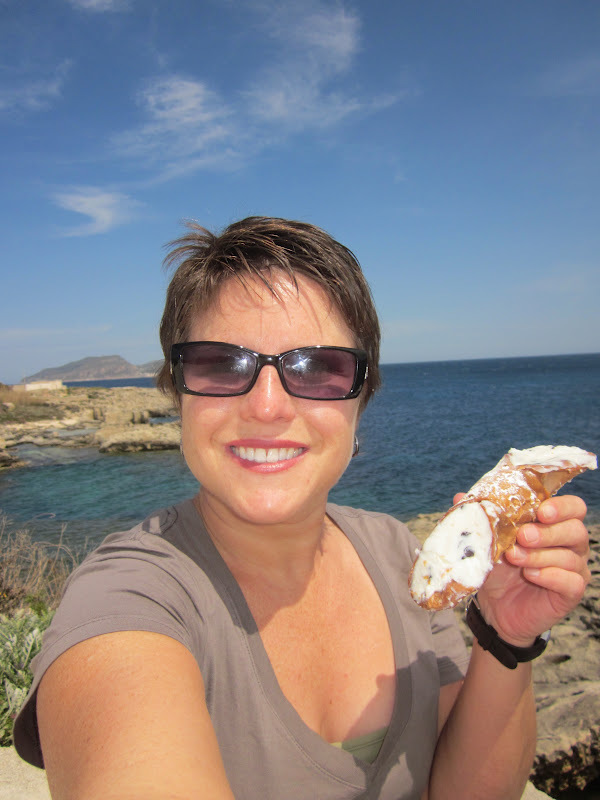 The cannolis in Sicily are rich! Because the cheese is so fresh, you can actually taste a bit of the "barn" (in a good way). This photo is of me enjoying my cannoli while taking a rest while biking on Favignana island (Egadi Islands). I thought it was a good reward! 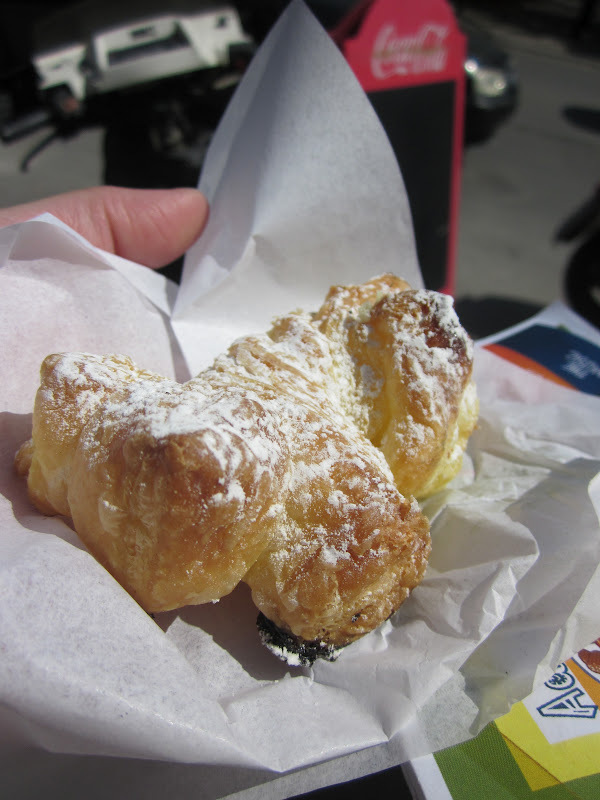 These pastries are a speciality of the hill town of Erice. The outer "shell" is made of flour, sugar, butter, eggs, cream and a hint of lemon. Hello ... delicious! The center is filled with a rich vanilla custard. Dusted with powdered sugar and served warm, Genovesi are a unique Sicilian treat! 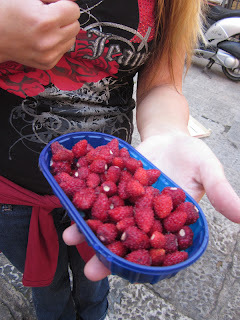 They are mini strawberries but packed with intensely sweet strawberry flavor. One of my favorite desserts I have had in Sicily was strawberries with sugar and drizzled with Limoncello. The gelato here is consistently some of the best I have had in all of Italy. It is literally puff pastry. Many layers of dough are folded together to form these airy delights. They are twisted and made into beautiful shapes, sometimes filled with jam and dusted with powdered sugar. This is a very sweet, dessert wine from the east side of Sicily in a town called Castlemola. It is served chilled, with a Sicilian lemon twist floating and is delicious when used for dipping almond biscotti!! Eating the lemon rind at the end is a citrusy and refreshing way to end the experience! 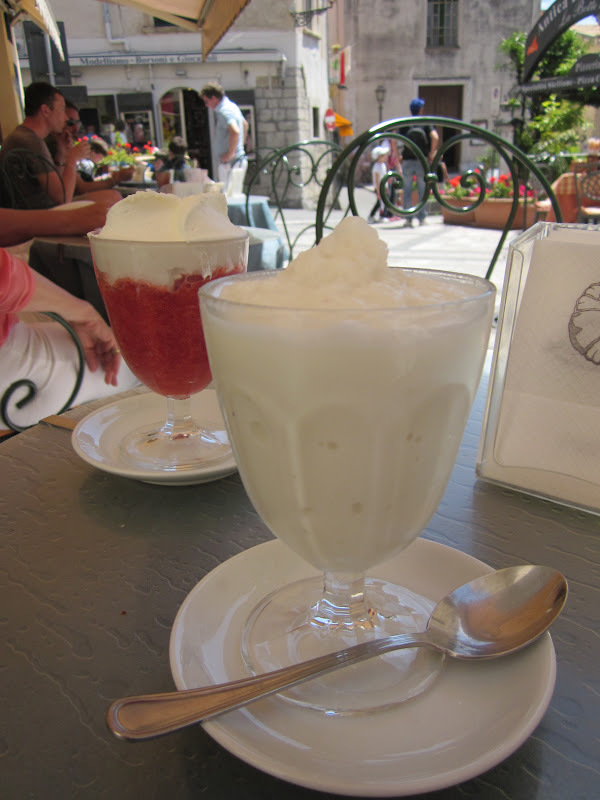 It is the Italian version of a slushy. Made from pure, seasonal fruits and nuts, these cold desserts are very refreshing on a hot day! The ice is pureed with the flavor of choice and made into a velvety iced texture. Most popular flavors are lemon, strawberry, coffee and almond. These almond cookies are to die for! They are essentially a marzipan cookie. They have a fudgy texture and are intensely sweet and almond flavored. The dough (paste) is made from almonds, sugar and glucose. No wonder why they are so sweet! This one is also filled with a lemon gel. YUM! 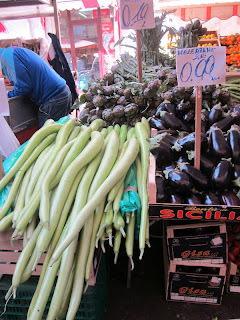 Sicily is known for its food! 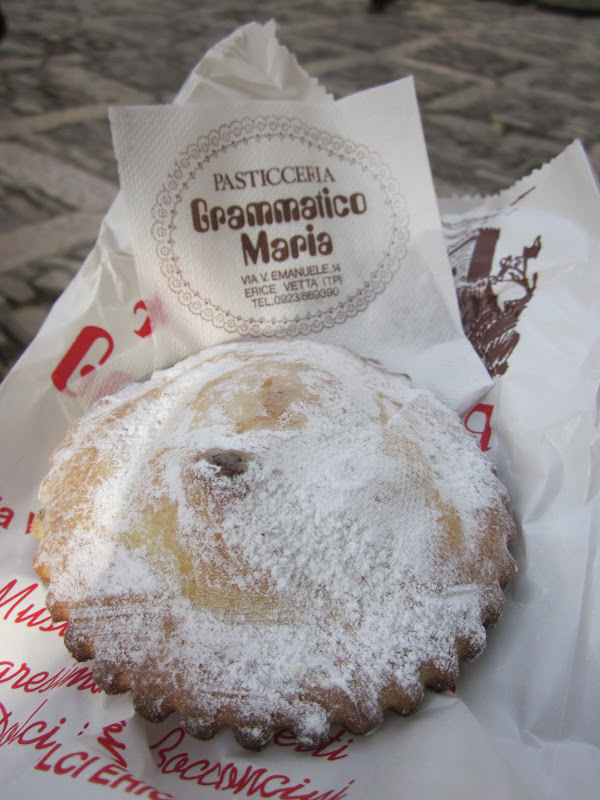 While visiting the western cities of Trapani and Palermo, I was on a mission to taste as many local specialities as possible. Mission accomplished. Arancini- fried rice balls. 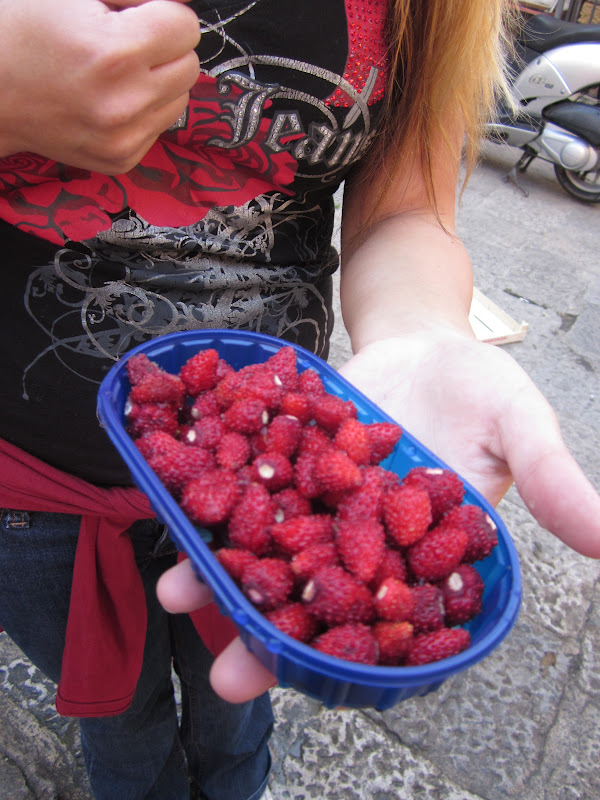 Delicious snack sold everywhere! 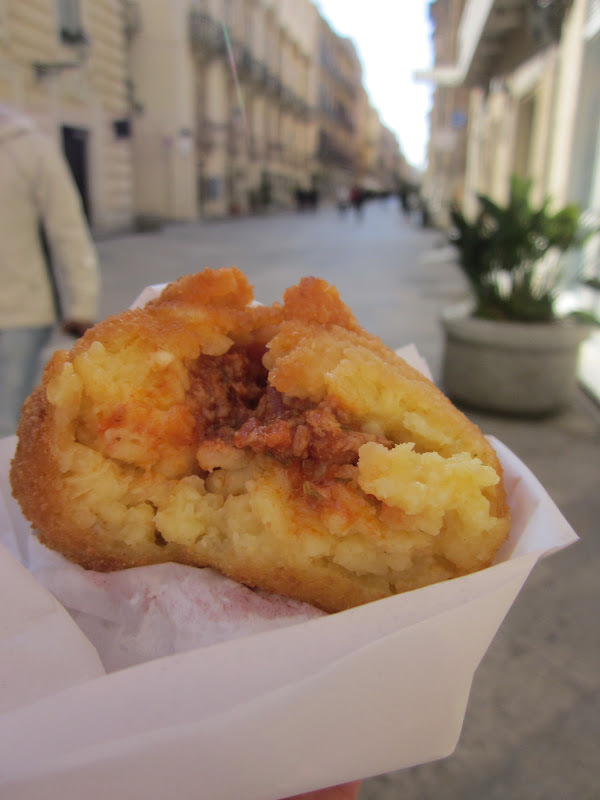 Traditionally filled with tomato sauce and meat, arancini can also be filled with spinach & sausage, ham & cheese, mushrooms, and many other vegetables & meats. In Palermo they often add Béchamel (white sauce- milk thickened with roux (butter & flour) and some aromatics) to the rice to give it an even richer taste. My first arancino, filled with ragu (sauce and meat). Busiata Trapanese- the curly pasta of Trapani. Every region (and sometimes each city) has its own pasta that is designed specifically for the specific sauce of that area. Sicilian oranges and lemons are among the best in the world. 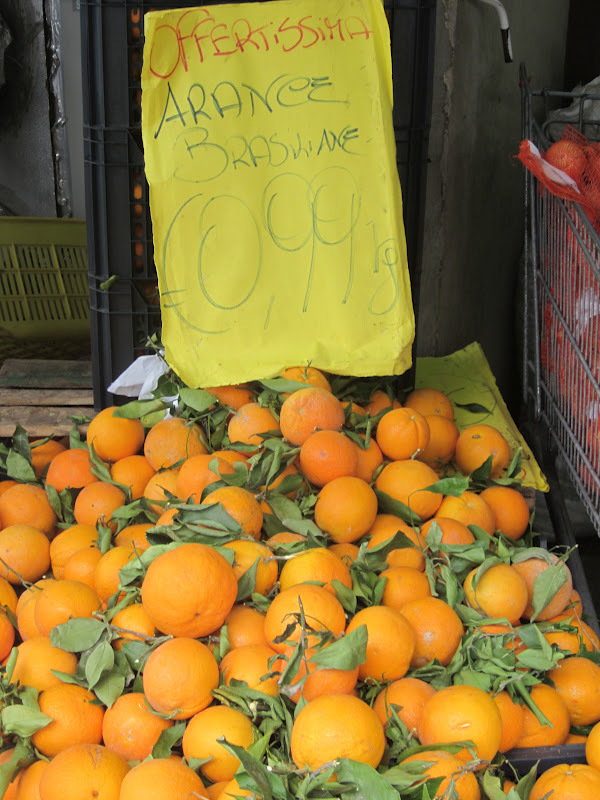 These of course are blood oranges! Pasta con le Sarde (Pasta with Sardines). 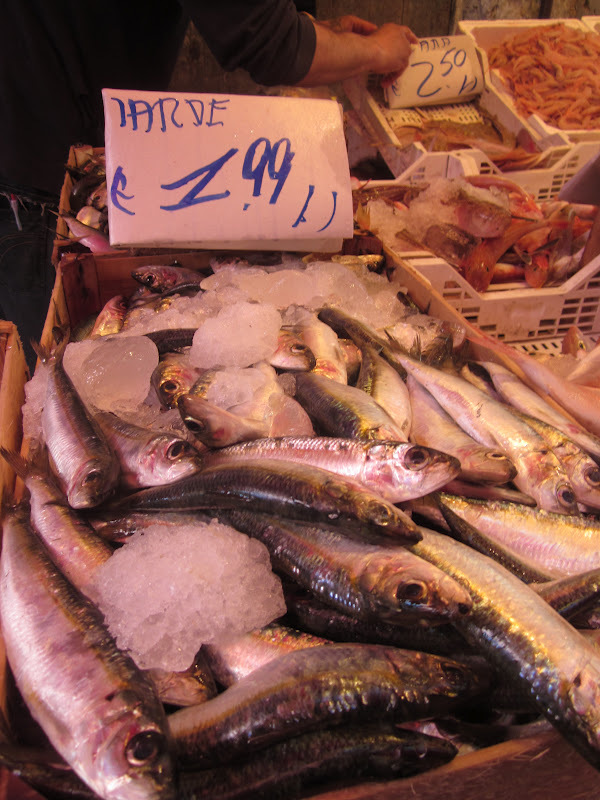 This is a typical dish of Palermo and when made with fresh sardines caught that day, it is simply amazing. Traditionally it is comprised of onion, wild fennel, pine nuts, sauteed sardines, and bread crumbs, served over spaghetti. 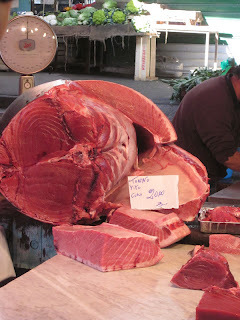 Butchering at one of the food markets in Palermo. Not so sure there is a HACCP plan in place here! Beautiful olives are found all over the markets! 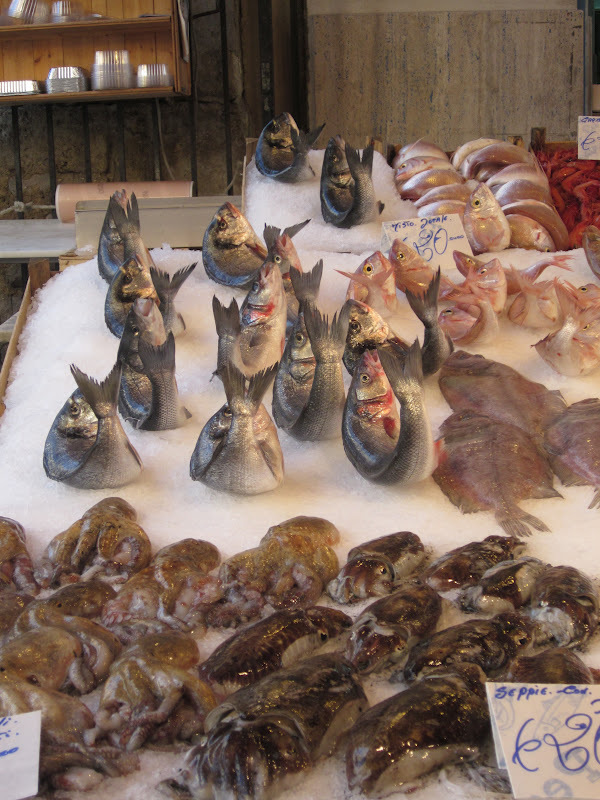 Sicily is known for its excellent quality of tuna. I have never seen tuna like this before! In addition to tuna, Sicily also has exceptional swordfish. Baked ricotta cheese, topped with Sicilian oregano, crushed red pepper flakes and an olive! Long zucchini. Seriously, that is what it is called here. Sicilian oregano is exceptionally flavorful! Spaghetti Siciliana. Typical Sicilian pasta dish with tomatoes, basil and eggplant. 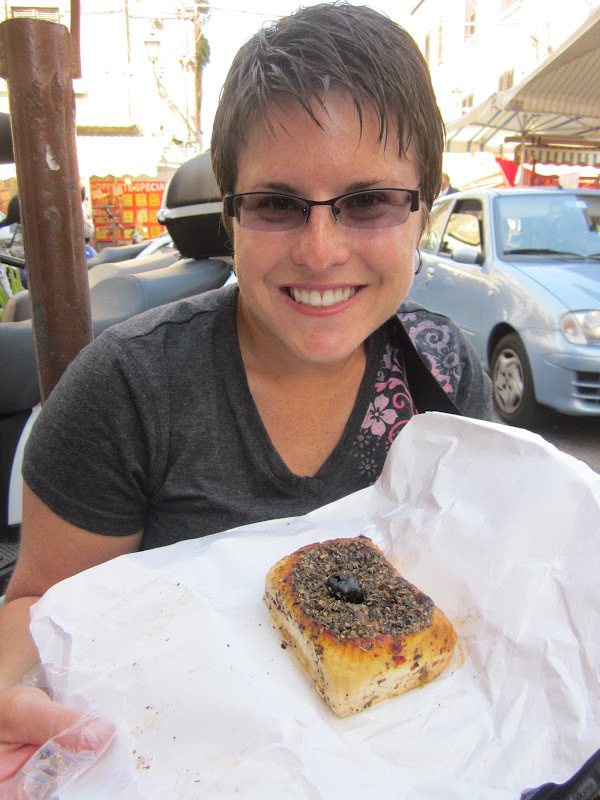 The eggplant here are sweet and delicious! One of the most popular dishes of Trapani (western Sicily) is Pesto al Trapanese. It is not the traditional basil-based pesto we often think of. Instead, it is a harmonious mix of tomatoes, garlic, basil, olive oil and almonds and it is to die for!!! I had the good fortune of learning how to make this simple but delicious dish in the home of a Trapenese couple. I hope you will try this in your kitchen as well! 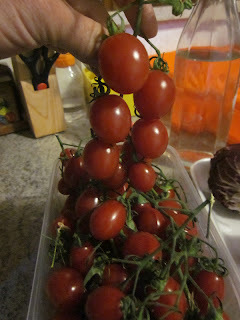 Start with Datterino tomatoes- similar to grape tomatoes but in the size and shape of dates. These are the sweetest "tomato candy" I have ever tasted! With a mortar and pestle grind together fresh garlic (1 clove per person with the core removed- it's bitter) and salt. Add chopped almonds and grind. Then add a large handful of fresh basil leaves and grind. 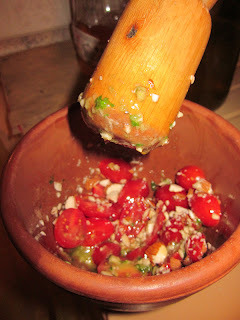 Finally add 1/4 of the total tomatoes you will use and grind into a "paste". This is the "paste", also known as the "mother". It is like bruschetta soup! To this mother, you will add the remaining tomatoes (quartered), Extra Virgin Olive Oil and then some fresh chopped basil. Set it aside. To make the pasta... This handmade pasta is called Gnoccoli. Add together flour and water until it is not sticky (no eggs). Let rest 30 minutes and then roll into cylinders that are approximately 3 in long. With your fingertips, press into the cylinder, leaving indentations. Then roll gently so it looks like above! Place on a floured sheet to hold. Fresh pasta only takes a few minutes to cook. You will know they are ready when they rise to the top of the boiling salted water. When pasta is finished cooking, drain and add to tomato "pesto". Toss all together and serve immediately. The pesto is heated by the addition of the cooked pasta. Top with fresh parmigiano or in this case, caciocavallo (semi-dry Sicilian goat cheese). 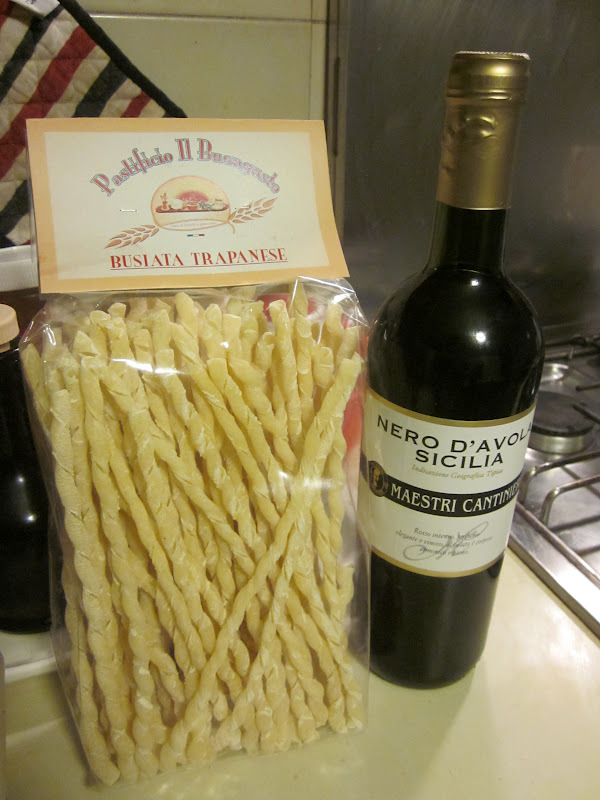 Traditionally this dish is served with Busiata pasta, the pasta of Trapani. 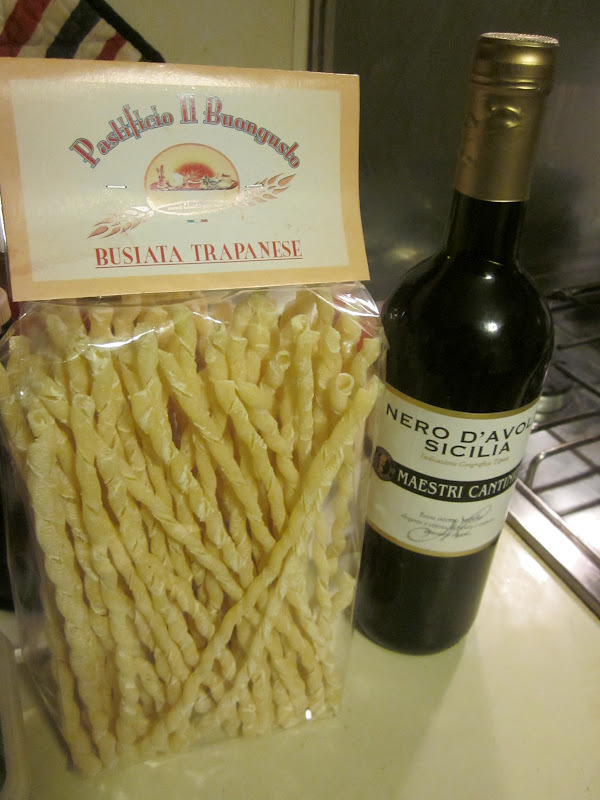 And a glass of Nero d'Avola red wine is a wonderful pair! How could you go wrong?!? !